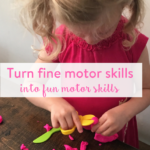 I love a good no-mess craft for my toddler. She feels the same way. She loves crafting but definitely doesn’t love getting messy. This is fine by me! Another dilemma for us is where to put her artwork. We have a stainless steel fridge which isn’t magnetic. I’m not a big fan of taping things to it so I’m left to find somewhere else to display her art. 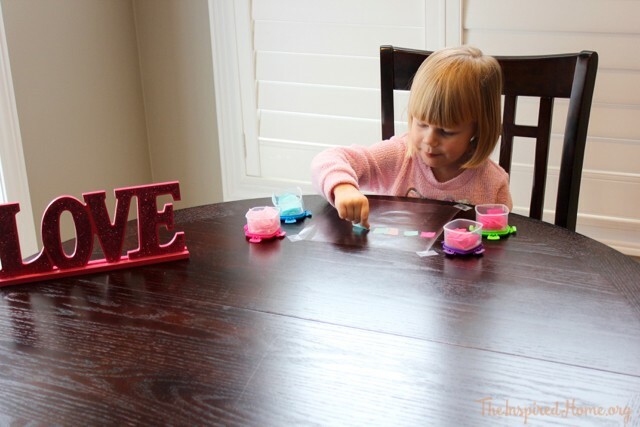 Making stained glass sun catchers is the perfect solution. As an added bonus, they dress up our back door wonderfully. Another thing I love about stained glass crafts is that I always have what I need on-hand: contact paper, tissue paper, tape and scissors. That’s it! Only 4 things. 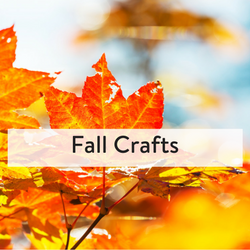 The craft takes a little bit of prep before you can let your toddler jump in but it’s nothing more complicated than cutting out some squares. 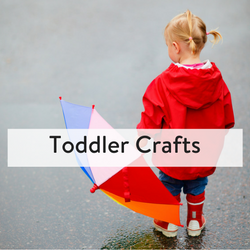 I usually do the prep after she has gone to bed but if your little one still naps (I wish!) then you can get this ready during that time. 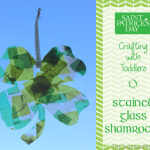 This Valentine’s Day stained glass toddler craft is guaranteed to be a hit with both you and your toddler. This is the label from the contact paper that I use. 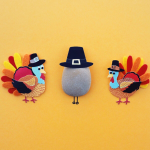 First, you’ll need to cut out two equal-sized squares from your contact paper. I did 10″ x 10″. I decided to set her up with one large heart. 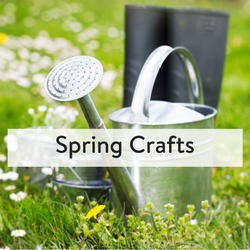 You may want to do a whole bunch of smaller ones. You will need two squares for each heart. 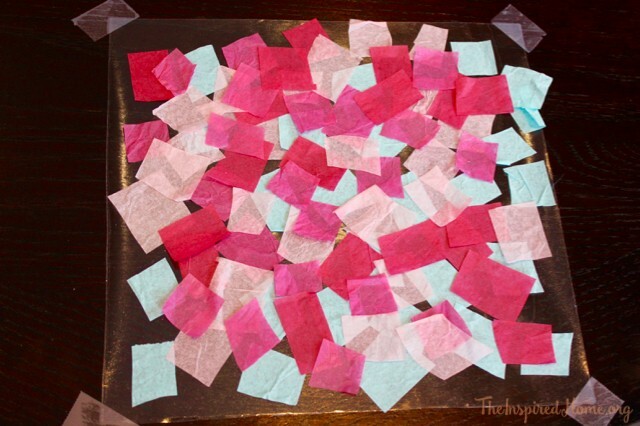 Next, cut up a few strips of each colour of the tissue paper into squares. Mine are about 1″ but it really doesn’t matter. Some of the colours I cut larger and others I cut smaller just for some variation. 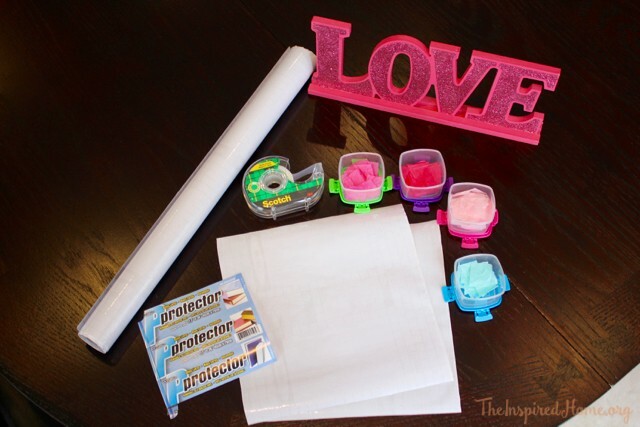 Clear off a workspace for your child on a table or even on the floor. Lay the contact paper with the clear side down. 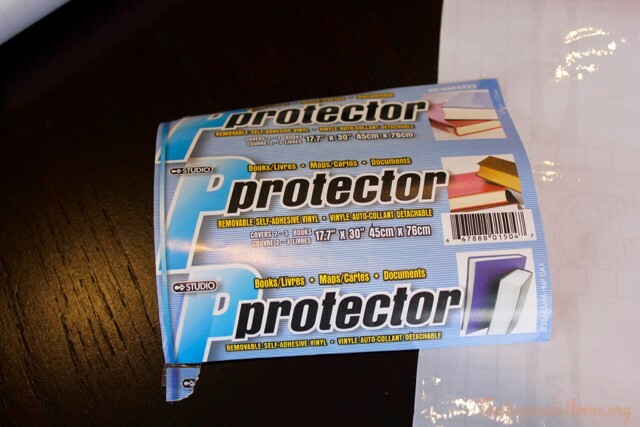 Lift the paper from the corners just enough to put a piece of scotch tape on each corner – you will be putting the sticky tape onto the sticky side of the contact paper. Peel off the paper. 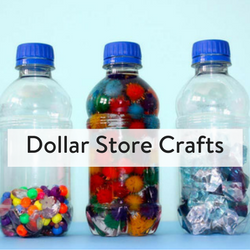 Give your child some little containers full of tissue and let them go to town! This is her completed work before I added the second layer of contact paper. 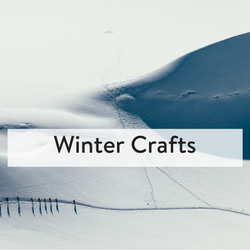 Once they have completed their masterpiece, you will need to place the other piece of contact paper on top to sandwich the tissue inside. Peel off the paper and line up the top edge of your square. Press out any air bubbles as you go and smooth it down. Fold your square in half (don’t give it a sharp edge, just enough hold it with your one hand). 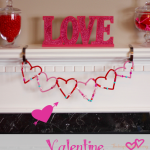 You’ll need to cut out a half-heart shape along the edge – you remember doing this in elementary school, right? 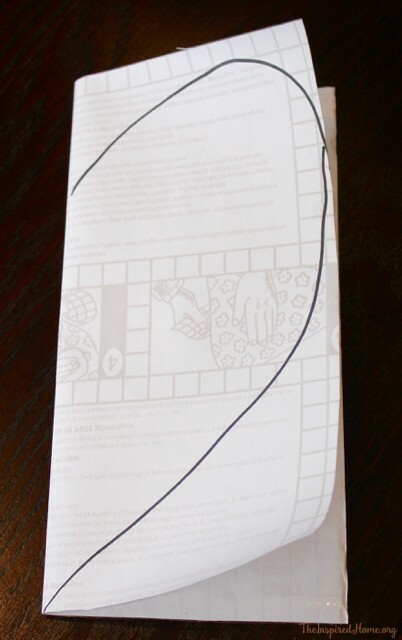 I drew the half-heart onto the paper of one of the squares as a visual – don’t bother doing this yourself as you’ll be peeling this piece of paper off the vinyl thus losing your paper guide! 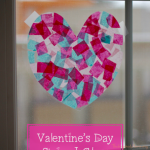 Once you’ve cut out the heart, display your toddler’s work of art on a window in your home. I secured it with some scotch tape but you could also punch a hole in it and hang it with some pretty ribbon. 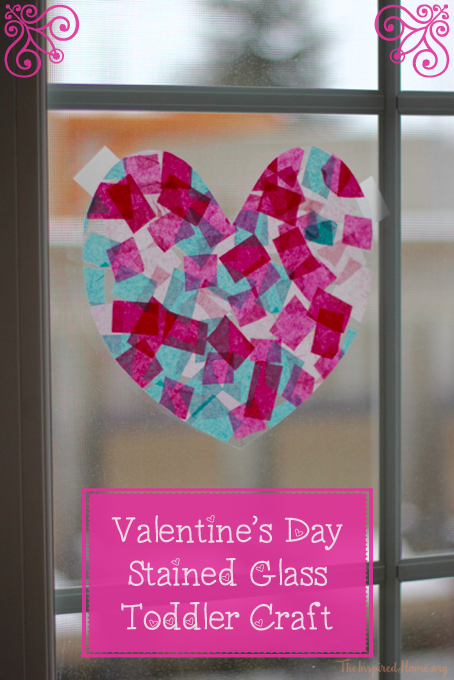 Everyone is sure to admire the beauty of this Valentine’s Day stained glass toddler craft. Hey, I might be able to pull this one off. I’ll check our dollar store for contact paper tomorrow.